Want to know more about your Luck, Wealth and Health redictions*? Am I lucky or unlucky now? If Unlucky, how can I clear my bad luck and be lucky again? What is the cause of my bad luck? How and when can I enjoy material wealth and financial success in life? Can I recover my debts or can I advert bankcruptcy? When can I marry? Will I end up in divorce? How can I have children? Is the man or woman I like compatible with me? Can I start a business on my own & when? Do I have any hidden illness eg. Cancer, fibroid etc. etc? Special Prayers to help you overcome obstacles and embrace good luck for a duration of one year. Want to know more about your luck, wealth and health Predictions ? Consultation Fee is $200 per Family . 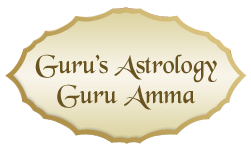 Guruamma is one of the most generous, kind and caring person i've ever met. She has always been on point in her astrology services and she never fails to amaze me and my family with her selfless nature. She is 100% trustworthy and i would truly recommend those who are going through downfalls in life to seek her services as she will find a solution to almost all yr problems and solve them !Her happiness lies in seeing everyone around her happy and that's what makes her a wonderful person! Thank you for being a living goddess guruamma. Love you so much! May God bless you and yr family always dearest guruamma!